Shortly before 11 a.m., CHP Officer Molinar, of the San Luis Obispo unit, was assisting a driver who had a flat tire. The vehicle with a flat tire was stopped in the center divider on northbound Highway 101 south of Marsh Street. Molinar parked her patrol SUV behind the stopped car and turned on her emergency lights because of the proximity of the location to the fast lane of the highway. While Molinar was conducting traffic control, a vehicle collided with the rear of the patrol SUV. Both Molinar and the driver who crashed into the CHP vehicle suffered minor injuries. 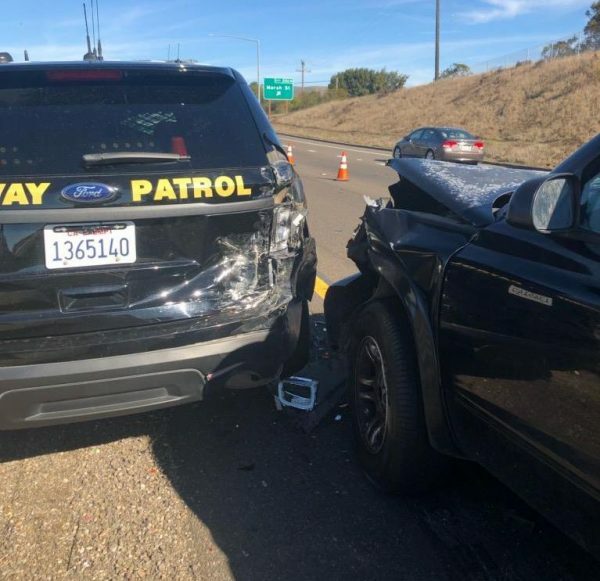 The patrol vehicle absorbed the impact and prevented the errant driver from crashing into the motorist who was changing a tire, according to the CHP. Just another day in the life of a CHP. Getting shot at, sued and ran over makes for a hard bring home the bacon job.